Now that this little project is out of the way, I can finally get back to regular blogging. Said project had a big problem with “fireflies,” or salt-and-pepper noise caused by difficult-to-integrate scenes. I’ll defer on fully unpacking the jargon (for the impatient, T.F.M. 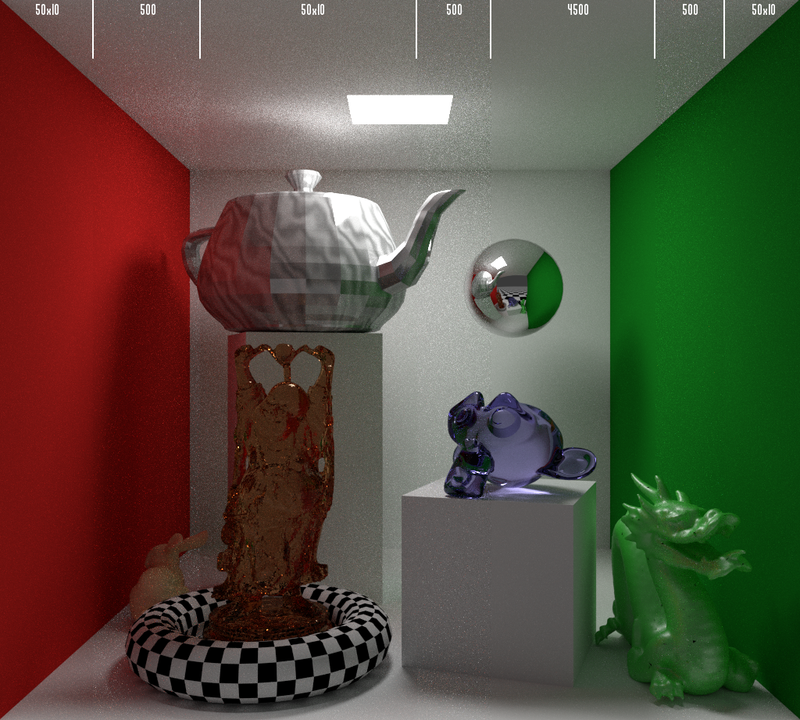 does a decent job), but the short version is that while Cycles and other path-tracers try to be smart about where they cast their rays about, some scenes just outsmart them. There are a number of ways to be rid of these pests; Andrew Price has an excellent article covering seven ways to do it within Blender, and if you kick in Blender’s compositor or pop open an image editor you also gain access to the median or despeckle image filters. But all those image techniques and five of Price’s seven suggestions are destructive, as in they throw out or alter image data. As ugly as those fireflies look, they’re still a valid light path through your scene. You can prove that just by cranking the sample count (one of Price’s seven) and watching them naturally fade away. So scrubbing them just feels… wrong. [HJH 2015/02/23] A very clever alternative comes from Sebastian Koenig, and involves hacking your shaders so that diffuse gathering rays only see diffuse surfaces. That’s not always an option (imagine a cave scene partly lit by water caustics), and it’s still altering your scene, but this technique deserves to be more widely known in my opinion. A third approach is to animate the random number seed, a technique that’s popped up in multiple places but seems to have originated with YouTube user “seltsamliebe”. Two renders of the exact same scene that use the same seed will have their fireflies in the exact same spot, as the light paths the integrator follows are determined by the same sequence of “random” numbers. Two neighboring animation frames will have a similar layout and thus a similar noise pattern, which both video compression and your own eyes will pick up on. Two renders with different seeds, however, will have their fireflies in completely different places, and two neighboring frames will have uncorrelated noise. So by plugging the current frame (“#frame”) into the random number seed, you can render an “animation” of your still scene and merge all the individual frames into one. The randomization of the fireflies will mix them in with saner light paths, resulting in a smooth image. 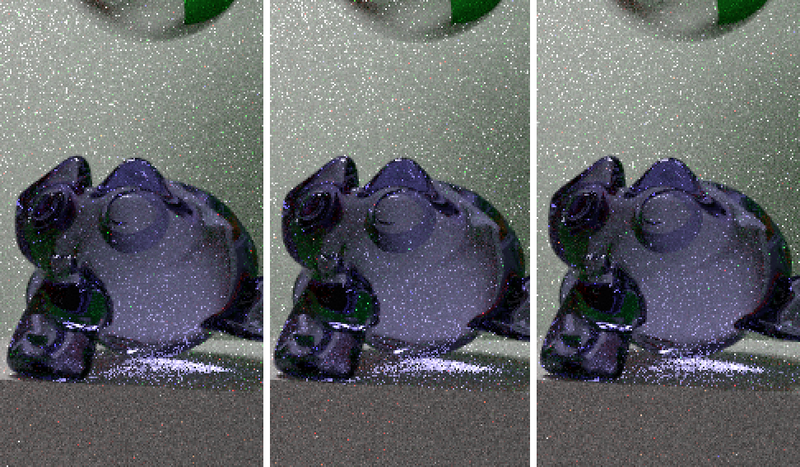 But while animations look nicer with uncorrelated noise, nice noise is still noise. And recent versions of Blender disable scripting by default, forcing you to manually enable that and potentially open yourself to malicious code. [HJH 2015/02/25] I’ve since improved on the #frame trick, and fixed the issues with animations at the cost of playing havoc with Cycles’ live preview. Check out the details over here, I think it’s a much better solution. Meanwhile, Palaes gives a quick tutorial on how to animate the seed value in a comment over here. It has the same issues as #frame, except it’s much much more secure. Greg Zaal came up with a better variation: he wrote a plugin which randomly changed the random seed, independent of the frame, and automatically merged duplicate frames. Now the same approach can work for animations… if you don’t mind installing an 18-month old plugin, one that forces you to kill Blender if you want to stop the render early. Still, it has the nifty feature of being progressive: the finished product is slowly built up in layers, so you can quickly get a feel for the final result. I couldn’t find his plugin back when I needed it, though, so I wrote my own solution. No plugins necessary, no need to modify the scene file at all, you just need a Unix-like environment, ImageMagick, and perl. The full source is at the end, but the results are… intriguing. 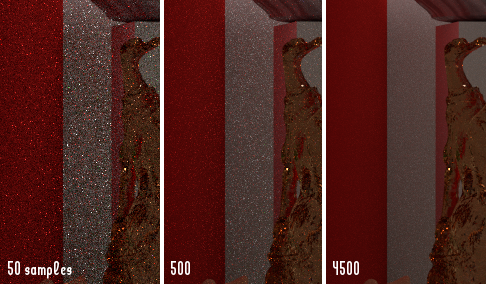 Despite the 500 and 50×10 renders using the same number of samples, the 50×10 render looks quite a bit smoother. In fact, by eyeballing different mergers, I can get something that looks about as noisy as the 500 sample image by layering together six 50 sample images, for a savings of 40%! But intriguing isn’t the same as surprising. Zaal points out there’s a non-obvious form of clamping going on here: those white pixels aren’t actually white, they’re clipped down from “super-white” to keep the overall image within the dynamic range of the monitor. He speculated any difference in performance would disappear if you shifted from a low dynamic range container like JPG or PNG to something like EXR, which wouldn’t clip anything. And he’s right, at least as far as my eyes can tell. He points to further proof: notice how the stacked version is darker than the straight-through one? That’s because it’s losing energy via those clipped values. So alas, this image stacking script is also tossing out data. But that doesn’t mean the script useless, either, as it retains all the benefits of Zaal’s plugin and adds several more. Want to continually refine your result, in perpetuity, rather that artificially halt it after X rounds? You can do that. And don’t worry about interrupting it, my script randomizes the frames it renders to prevent uneven “baking.” It also runs from the command line, and as mentioned doesn’t modify the .blend file itself or requiring a plugin, which makes it handy as part of an ad-hoc distributed renderer. And it can either update finished frames on-the-fly or wait until the end before consolidating; the former gives you that nice progressive render and saves disk space, but the latter uses CPU time more efficiently. INFINITE="no"           # should we loop infinitely? echo "Hey, '$INPUT' isn't a file! Please fix!" echo "No increment? We'll go with 11 then." echo "Whoa, we can't render frames $START to $END. Check your parameters." # going frame by frame, thanks to GPU flakiness; shuffle to avoid "hot spots"
# silently condense multiple renders into one; handy if you're consolidating from other machines! convert `for ITER in $SEQ ; do echo "$BASE.png" ; done` "$BASE". *.png -average "$BASE.temp.png"
echo $((COUNT+`ls -1 "$BASE". *.png 2>/dev/null | wc -l`)) > "$BASE.count"
if [ ! -s "$BASE.count" ] ; then                # ensure this file exists! # condense multiple renders into one; handy if you're consolidating from other machines! The reason why “10×500” images produce less fireflies than “5000” samples, is because the resulted image files cannot store light values over 1, thus, every firefly will add max 0.1 light to the pixel of the final image. Internally Blender uses floating point variables to store the luminescence of a pixel, so it is possible that a firefly is resulted by a ray hitting a very strong light, and it might be, that after 500 samples, the pixel has still more than 1 strength, let us say 10. Than after 5000 samples, it will still have 1 brightness. In “properties panel / render / sampling” set “clamp indirect” and maybe “clamp direct”. 10, 5, 2, or somthing you like, experiment with it. It will result the pixels to have at max those values while rendering. Note that both your method, and clamping results some loss of light. It is number 6 in Andrew’s list. Render scence with clamping set to 5, do a 1000 samples render. Do also (with clamping) a “10×100” render and compare. PS: Sorry, I missed a part, so I explained something already in the post. so every frame will use another seed. In the end, the difference is that the stacked image retains its highlights and bright bits where they should be but the areas that had fireflies far apart might be darker than they should be. The clamped image will have less contrast in the caustics because the samples are more similar in value but it could be darker than it should be and miss a few important highlights. He advocates for a mix of clamping and stacking, which I think is an excellent approach. That’s there, too. 😉 This post is less about “here is the BEST way to eliminate fireflies” than “here’s a whole bunch of tools to eliminate fireflies.” Version 1.0 of this script saved my bacon while doubling as an ad-hoc distributed renderer, but it might be an overly complicated or impossible solution for you. And that’s cool! It’s just one more technique to have in your toolkit, nothing more. I would be interested in a 10 x 50 with no clamping and a 500 with clamping set to 50. 🙂 PS: Sorry for beeing critical, it is good post, and also a good technique. It also has the bonus of being able to “pause” rendering. Yes, it is also a good way to distribute work for a single image render between multiple machines, while having the bonus if getting rid of additional fireflies. If I clamp an overburnt ray to 50, and wait 50 samples, than it will even out to 1 strength. If I leave it extremly bright and than clamp it to 1 after 50 samples, should it not result the same luminance? But it came to my mind that I did not take into account that there is a rally small chance of having overbright rays near in time. I meant that you do not need scripting, simply keyframes. Technically, the #frame trick is a form of scripting. If I’m reading this page correctly, a type of script called a “driver” can be plugged into numeric inputs. You tell Blender to call a driver by prepending a “#” to the driver name, hence “#frame.” Other drivers are available, and you can edit an existing driver in Graph view (enable the Properties tab). By following the links there and enabling Auto-run, I was able to improve on the #frame trick! I’ll add the info up above to the post shortly.